One thing is for sure. If you market online you need traffic and not just any traffic, you need targeted traffic. 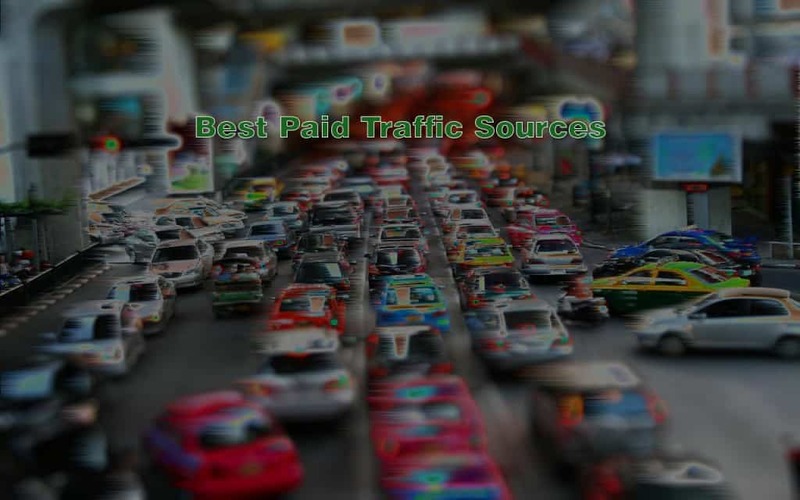 Today we are going to cover the best paid traffic sources you could be using in your business. And it doesn’t matter if you are an affiliate marketer, a local business or an E commerce store. When starting out with a brand new website for the first time, many webmasters make mistakes. The biggest problem that usually have is, they have a brand new website and no traffic. So, they either add a few pages and wait for some Google traffic or start looking for paid sources of traffic. The problem is, they usually choose the wrong source of traffic or do it wrong all together, or expect way too much from what they choose. Turning any website into a traffic leads machine can take time when doing SEO but, with paid traffic it can be much faster however, you just have to know what you are doing. This is where the 80/20 rule will apply. You really need to focus 80% of your time on the 20% of traffic sources that will actually help you from the start. Then, once you get going you can add in other sources to the mix. So, how do you know where to spend your time and money on paid traffic? It’s a little different for each type of business but one thing you need to keep in mind is building an email list. Always when you can try to send traffic to grab a potential prospects email so you can send helpful information and promotions at a later date. Or course, you will not always be sending your paid traffic to a capture page but always keep it in mind. You list is very valuable to your business. And if you lose any source of traffic, you will always have your list which will be able to send traffic at anytime. Now, with that in mind, lets cover some paid traffic sources for a few different business types and what each one could to with paid traffic. Now, for a local business there are a couple things they could be doing to get traffic to their site, while they are waiting for their seo campaign to start producing. Many local companies advertise on Google adwords. These are the ads you see on the right and the top of Google’s search results. They can be very effective for local companies or they can flop. Most small companies can get these ads to work. It just takes time and some quality training. Also, they may work a little better at first for a local computer repair shop over a massage company. The reason this happens is people need computers and phones fixed right away. Need a massage might not be an imitate need. But, with a little trial and error, the massage company could make Adwords work for them. Testing different ad copy is the key to success for a local company with this source of traffic. You will also need to find profitable keywords for your business. You can start with only a few keywords for your business and then work from there. If you are not sure which will be producing keywords you could start off with a broad match modified setting. This will allow you to discover profitable keywords. And after your campaign has been running for a few weeks, you can use search reports to see the actual producing keywords and then start refining you campaigns. If you are unsure how to do this, you can either call Google or hire an expert to setup your campaigns for you. This again, will all depend on your budget. But, it may be worth it to at least talk to an Adwords consultant to start. Most local companies also send their Adwords traffic directly to their website. While this may work for some, I would suggest you use a landing page for your Adwords traffic. Using a landing page will allow you to get rid of more distraction from the page and have your visitor focus on your CTA (call to action) you want them to do. This will either be a phone call or filling out a web form usually. Also, if you don’t get Adwords to work right away for your local business, don’t cream it doesn’t work. It is an investment for the long haul. Set you budget and give it a few months. Adwords is not a set and forget system. You will need to work on it and refine it all the time. You have to be optimizing your campaigns all the time. I would also test our Bing Ads for your business. Bing ads reach also on Yahoo. They both produce much less traffic than Google but, you may find they work great for your business. You are building a plan here and adding Bing into the mix helps with your plan. While there are other traffic sources local companies can use, we usually suggest they start with Adwords and work on their campaigns and learn how to use it correctly. And once your seo campaigns set’s in, you will find mostly your two top traffic sources will be Adwords and Seo. But, there are other sources you can try. Angie’s list can be a great source of traffic for local companies. It has worked great for companies all the way from local contractors to dentists. But again, you will need to test it out. If you get involved with Angie’s list, they will usually want to sell you their top ads package. Start small or whatever you budget allows and test it out. It may or may not work for you. Yelp can be another great place for traffic. Many local companies are on Yelp and it’s many times, a great addition for a local business. Again, they have ad packages they will want to see you on. Test small and see how it goes. Later, you can invest more if it works. Also, always understand, using companies like these you will be getting reviews for your business. While reviews can be a good thing. They can also ruin a business when your company gets bad reviews. People are not shy about writing a bad review if they had a bad experience. So, if you use one of these sources, always have a plan in case you get bad reviews. Facebook can be another great way for any company to get traffic. You build a business or fan page, and get traffic with paid ads and by sharing viral content. You can also like other business pages and make comments. When trying organic free ways to get traffic by liking other pages, you’ll want to keep these to a minimum so you don’t seem like a spammer. Just like a few pages or so a day. Paid Facebook ads can produce traffic at alarming numbers when done correctly. You will need to test out sending paid ads traffic to your website or Facebook page. The best way to make any social campaign work is by choosing an image or video people have shared elsewhere. You will also need something relevant to your business. You then post this to your page and you can either boost the post or use a dark post ad. Again, testing is key here. You will want to test out sending traffic to a landing page, your own website and or a lead capture page. And everything will all depend on your offer or sales message. If you are testing things out and not getting your traffic to convert, look at what your offer is. It might not be too enticing for your traffic audience. It’s always good to build your business page with likes. Once you get a steady amount, you can then use Facebook ads (dark post, boost post) to reach more of your page subscribers. The reason this works sometimes better is, you have already built a relationship with your page subscribers. Too often when selling online, business owners try and make the sale right away. This can work sometimes and it all depends on the company. But, usually building a relationship with people is a much better way. You see once people start seeing you post helpful content on Facebook, they will be that much more inclined to take you up on your offer when you to produce them. So, always build relationships first and sales second. With affiliate marketing you have a much broader range then with a local business. So you can generally try out other traffic sources also. Sure, affiliate marketing can benefit from all the sources talked about above. And it can also benefit from more sources. Pay per view ads can benefit affiliates greatly. And, you can usually buy them for pennies. PPV can also be great for list building. When using PPV, it’s a much better idea to send prospects to a landing page to capture their email. You would then add them into your sales funnel and send out a few emails about the promotion they just saw. Now, Pay per view does not work for everyone. This is why it is important to test a small amount and then scale up your paid ad spend. e commerce can also benefit from most the paid traffic but and a few other ways also. E commerce is a little more tricky however. Again here, it may be best to try and build a house list and sell to it rather then always going for the sale straight away. When it comes to E commerce, you can use Google products ads for your merchandise. It’s also another part of adwords. Google used to use what they called the merchant center however, it’s now called Google Shopping. These campaigns can work if you have a large or small store. You will have to test out what works for your store. Paid traffic is great for getting traffic to any business website fast. It can really help if you are just getting started, especially if you are waiting for an organic search campaign to start producing traffic. Always be mindful of what you are spending and realize, you don’t just want to throw money out the window. You do this by optimizing your campaigns and track everything. Then, each month check over the reports and see what’s working and what’s not. Then just refine your campaigns.